Tomorrow's Derby Day (which is a Very Big Deal here). Let's have good thoughts that all the horses and jockeys stay safe (and that I get lots of Derby Pie). And while we're waiting for the call to the post, here are some links for you to check out. Can two books have the same title? YES! Isn't that a copyright infringement? NO! I guess after years of working in bookstores and libraries, it's not news to me that more than one book can share the same title. Kate Milfold's upcoming middle-grade book The Boneshaker shares a title with Cherie Priest's adult book (out last fall) Boneshaker. Read Kate's thoughts about the title deja vu and then read Cherie's thoughts. I love that each author has read the other's book! Thanks to Fuse #8 for the link. Do you love polls? I kind of do. Recorded Books K-12 is asking What Are the Top 20 Children's Audiobooks? I know the post asks teachers to vote, but I checked and public librarians can weigh in as well! So head on over there and submit your list or just head over there to see what audiobooks others love. 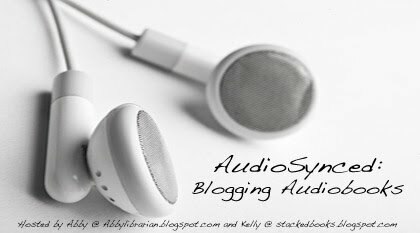 Speaking of audiobooks, have you submitted a link for this month's AudioSynced Roundup? Kelly will be posting the roundup tomorrow, May 1, over at Stacked. Send her a link or stop by and leave your link in the comments of tomorrow's roundup. Didn't get a chance to review an audiobook this month? No worries - I'll be hosting another roundup on June 1 right here. And speaking of polls, you have through the end of today to send in your top 10 YA books to Persnickety Snark to be counted in her Top 100 YA Books poll. She's got over 600 people who've sent their lists - stand up and be counted! Can I just say that I love Associate Editor Katherine Jacobs's post What's On My Desk? because that is exactly the process my desk goes through on a weekly basis? I pile things up until the stacks get too high and I just have to spend an hour cleaning off my desk. If you haven't seen the What's On My Desk? feature at the MacKids Blog, do check it out. If nothing else, it makes me glad I'm not the only one with piles! And I think that's all I've got for you this week. Have a great weekend! 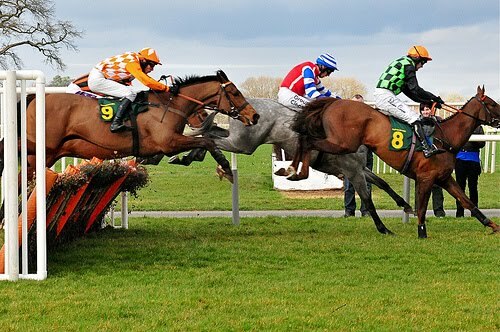 Photo from Paolo's Camera (and, it must be said, NOT from an actual Derby race).